I have never played Dark Souls. I believe I should probably preface this article by making this fact clear. The original Demon's Souls hated me. It hated my mother. It hated my whole damn family. I died so many times in my first hour of playing the game I just could not continue it. That being said, I can appreciate the nature of Demon's Souls and its successor, Dark Souls. I can understand that the games have their hard-core fans who love the challenges the games provide, and while I am not one of them, I can fully respect them. So there's me, having given up Demon's Souls and never played Dark Souls, trying out the Dark Souls 2 demo this week at Namco Bandai's Tokyo headquarters. Somehow opportunity had placed me in front of the demo machine, so I took it. The demo began and I chose a class from a selection of prepared characters. Going for the neutral, vanilla route, I chose a warrior, and entered the game. The blood message system is still present – though it is no longer tied to items and is a selectable command, rather than an expendable item – and a message left on the ground told me that I may want to light a torch in the spot ahead. I lit a fire and then proceeded to light a torch as the message said. Another blood message suggested that perhaps I try jumping off the cliff ahead, to which I obediently complied. After the "YOU DIED" screen disappeared and I respawned as an undead/hollow, I decided to ignore the second message and instead headed in the opposite direction. I encountered a shambling zombie which I was able to quickly dispatch before continuing down the path. I killed a couple more zombies before I came upon some run-down remains of a fortress that I entered and was almost immediately surrounded by 4 or 5 zombies – I don't know, I died before I could properly count them. I respawned at the starting point again, this time with less HP. According to the developers, playing as undead/hollow is no longer as beneficial as it was before. Other players can now invade your game when you're undead/hollow where they couldn't in the previous game. Consecutive deaths also lead to a penalty of decreased max HP with a penalty of up to 50% of your original HP. Dying too much also causes your character appearance to change to a more "undead" look. Dark Souls 2 director, Hidetaka Miyazaki revealed that "Under certain conditions, the penalty can be more than 50%" and that under this unspecified circumstance, a player's character would be "much more ugly." Edit: The director of Dark Souls 2 I spoke to was Yui Tanimura. Hidetaka Miyazaki is not working on Dark Souls 2. I got the names mixed up. Resurrection is now done by using an item called a "Human Effigy" that can either be found or bought. Since I was playing a demo, I had been supplied with infinite Human Effigies, so I quickly used one, restoring myself to full health only to be killed again in less than a minute. So, it looks like Dark Souls 2 hates me as much as Demon's Souls did. Which is to say, the game is gritty, unforgiving, and something I am entirely no good at. 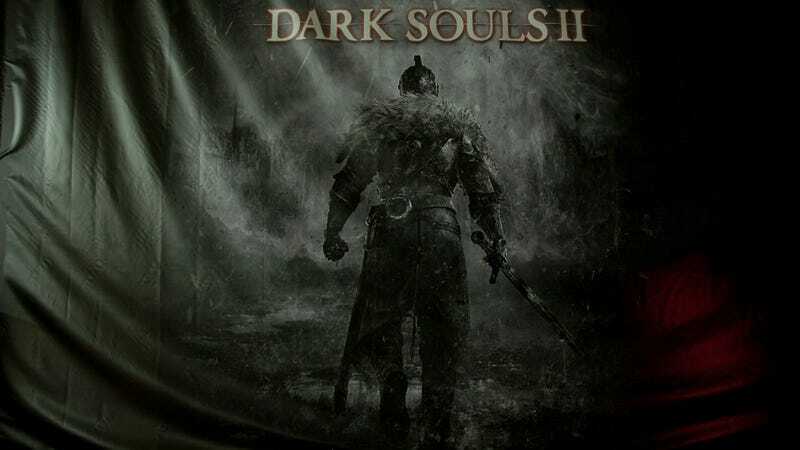 Director Miyazaki (Edit: Tanimura, not Miyazaki) stated that where the core theme of Dark Souls was "Humanity," this time, the core theme of Dark Souls 2 is "Curse" (Not the status affliction, but some other "thing"). I suppose that I'm "cursed" never to be any good at these games. Demon Souls 2 may not be "for me," but it never pretended to be, and I admire it for that. Dark Souls 2 will be out for the PS3 and Xbox 360 in the US on March 11th and in Europe on March 14th. A PC version will be released after at an as-of-yet unannounced time.